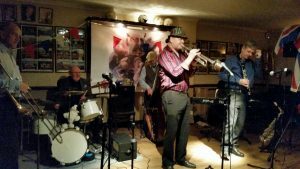 This was ‘HERSHEY AND THE HOT SHOTS’ very first visit to FARNBOROUGH JAZZ CLUB on 5th December 2015. 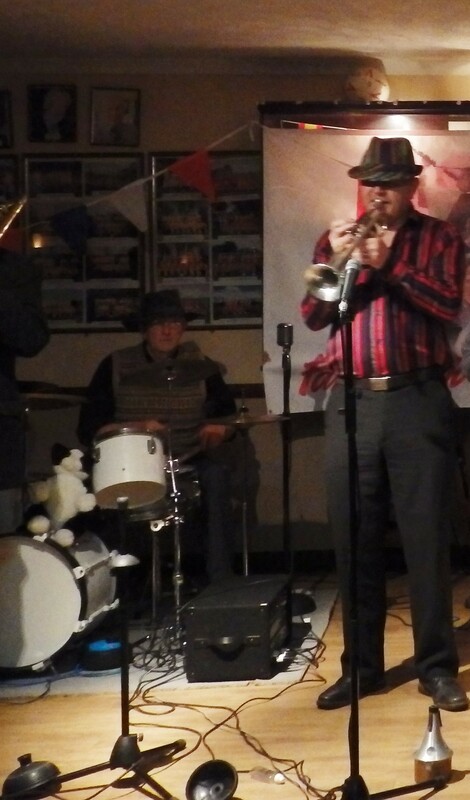 The guys in the band who played were PETER LEONARD (trumpet &vocals), TIM HUSKISSON (clarinet &alto sax), PAUL TAYLOR (trombone), ANDREW CLANCY (piano), ROGER CURPHEY (string bass) and GRAHAM COLLICOTT (drums). Hershey and the Hotshots play for the first time at Farnborough Jazz Club on 4th December 2015. (LtoR) Paul Taylor (trombone), Graham Collicott (drums), Peter Leonard (trumpet&vocs), Roger Curphey (double bass), Tim Huskisson (clarinet&alto sax) and Andrew Clancy (piano). Photo by Jill Alexander. It was Andrew’s first time here, but the rest have all played here before with other bands. Peter played here a long time ago, with George ‘Kid’ Tidiman’s band. It was back in 2014 (4th April and 4th July 2014) and he remember it too – nice one. Paul was here for Keith’s birthday in last August with ‘Harry Strutters Hot Seven’. The rest of the band you know well. I have to apologise too, for being so late with this newsletter, especially being their first time together. I had mislaid my notes (well, it was Christmas time) to remind me of what they played and is no reflection on how they played. They certainly played some exciting jazz, great for dancing, as well as listening to … getting us in the festive spirit (that included my bah humbug, Keith ha). Here goes to let you know what was played and my first choice of song is ‘Baby Wont You Please Come Home’, sung beautifully by Peter and everyone played well, with particular mention of Andrew. 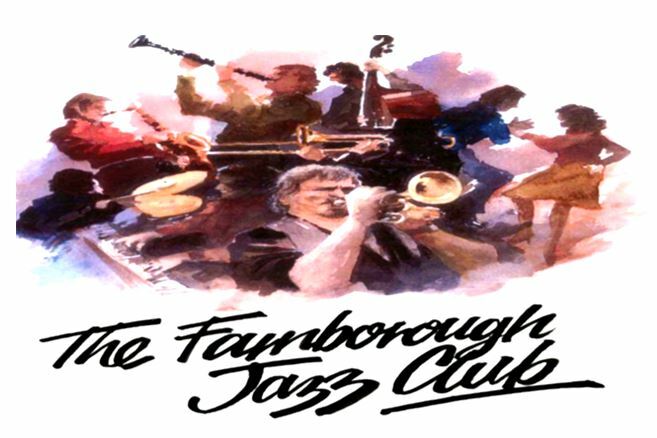 ‘Hershey and the Hotshots’ play for the first time at Farnborough Jazz Club on 4th December 2015. Peter & Graham play fab duet. Photo by Jill Alexander. Graham’s partner, Jill (as promised) led us into some swinging line-dancing with their next tune, being the ‘Charleston’. I believe Jill was a dance teacher and she certainly got us going. As for the next one, ‘Hyawatha Rag’, they were all brilliant and I particularly loved the excellent bit of trumpet and drumming duet from Peter and Graham in the middle. As already mentioned, it was Andrew’s first time here and we all thoroughly enjoyed his playing especially to ‘Do I Want You (Indeed I Do)’. Then I can remember the dance floor was highly used with everyone singing when they played ‘All Of Me’, as was too with the next number, ‘Bye Bye Blackbird’. We obviously love a song or two in the audience – ha). Our photographer friend Mike was still away and luckily Jill Alexander and Peter Marr took these photos of the band to make the evening. It certainly makes a difference to see some photos, even when the lighting isn’t so good (a bit atmospheric, don’t you agree?) Anyway, Keith had a sit-in next, whilst Graham had a dance with Jill (foxtrot I think). The tune being ‘My September In The Rain’, with Peter playing lovely muted trumpet and also singing. ‘Hershey and the Hotshots’ playing for the first time at Farnborough Jazz Club on 4th December 2015. 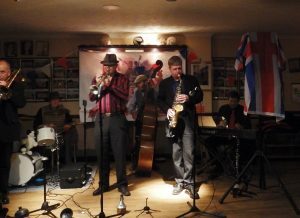 (LtoR) Paul Taylor (trombone), (Keith Grant has sit-in on drums), Roger Curphey (double bass), Peter Leonard (trumpet&vocs), Tim Huskisson (clarinet&alto sax) and (out of view) Andrew Clancy (piano) and drummer Graham Caulicott dances with Jill. Photo by Peter Marr. 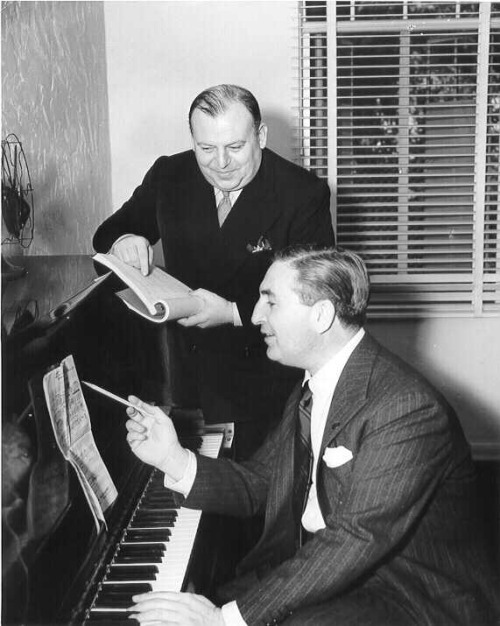 Harry Warren (composer &lyricist) and Alexander ‘Al’ Dubin (lyricist) of ‘My September In The Rain’. What a super Louis hit tune came next, ‘Swing That Music’, with part of it being played only by Peter, Paul and Mar…no, I mean Tim, the front liners only, absolutely wonderful. Graham gave a great drum solo too. 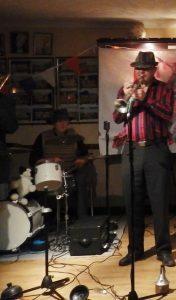 They finished off with Glen Miller’s ‘In The Mood’, just fabulous, everyone played their socks off – Paul on trombone, Peter on trumpet, Tim on clarinet, our Roger on string bass, Graham on drums and our newcomer Andrew. Another fantastic night. Those who were there listening, thoroughly enjoyed themselves thanks boys. This entry was posted in Hershey and the Hot Shots on December 10, 2015 by Diane.